The weather is already giving way to a splendid beginning of spring. It's wonderful. It's beautiful. Oh, it is just so nice to be finally out again, feeling the sun beating on my skin, breathing the crisp air and the enjoying the perfect temperature (not so cold and not too hot either). And just looking up in the almost cloudless blue sky makes me feel revived again. For the three years that I have writing in this blog, and if you have been reading what I have been writing, it is very evident that spring is my favorite season. And here we are again. I can't wait for the new spring vegetables and fruits to come out in the markets again. To have a focaccia, pizza or torta rustica (pie) at home, sometimes, I just buy the pre-made dough at the supermarket when I don't have the time to make them. I go for shortcuts like everyone else because even if we say that home cooked food is always the best, quality home time is still the priority. Since I find myself always deep in work, I am in frequent need of squeezing in time with my family. When my daughter comes to me and asks me to play with her and I have a million and a half things to do, my heart crumbles because she has the absolute right to ask me for some time together. I always tell her that I have to do a lot of things (which I hate saying) and I can only play with her a couple of rounds of domino (sigh, how I can I put a limit to my only time with her? ), which is our current favorite game. So forget about starting everything from scratch, because the kids will never remain kids and ask me to play. My solution is to get the pre-made ones to save on time. 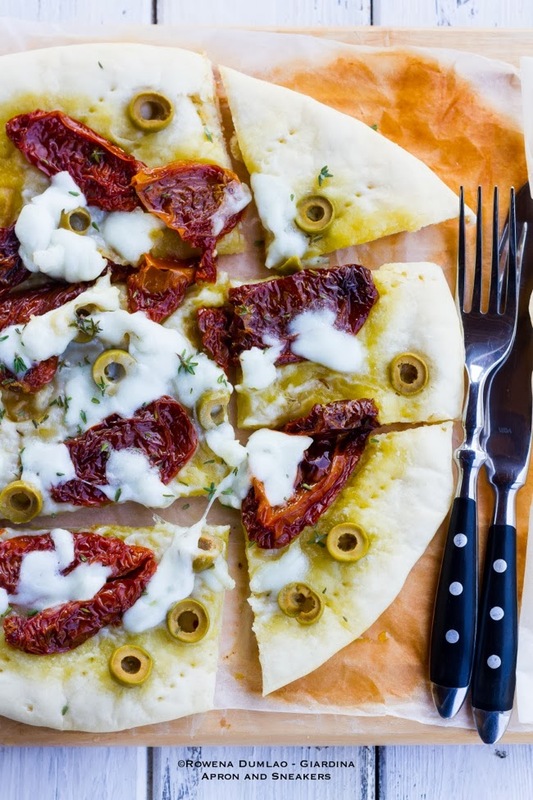 The flavors of this focaccia were quite decisive with the strength of the sun-dried tomatoes and the olives. The mozzarella toned down the tastes and put them together well with the help of the fresh thyme. Quite a simple but delicious combination. Buon appetito! 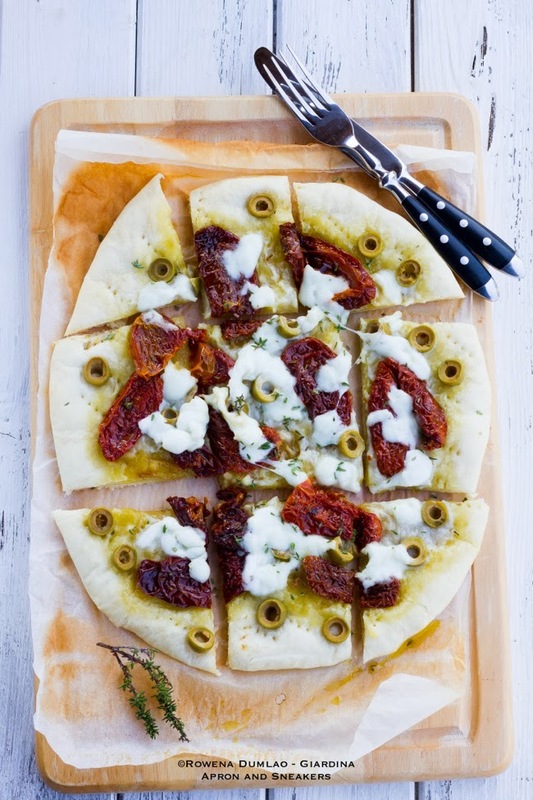 Distribute the sun-dried tomatoes, olives and thyme on the focaccia. Push them lightly in the dough. Drizzle with extra virgin olive oil. Make it rise again in a warm, draft-free place for half an hour. Bake in a pre-heated oven at 220 degrees Celsius for 15 minutes in the middle rack. 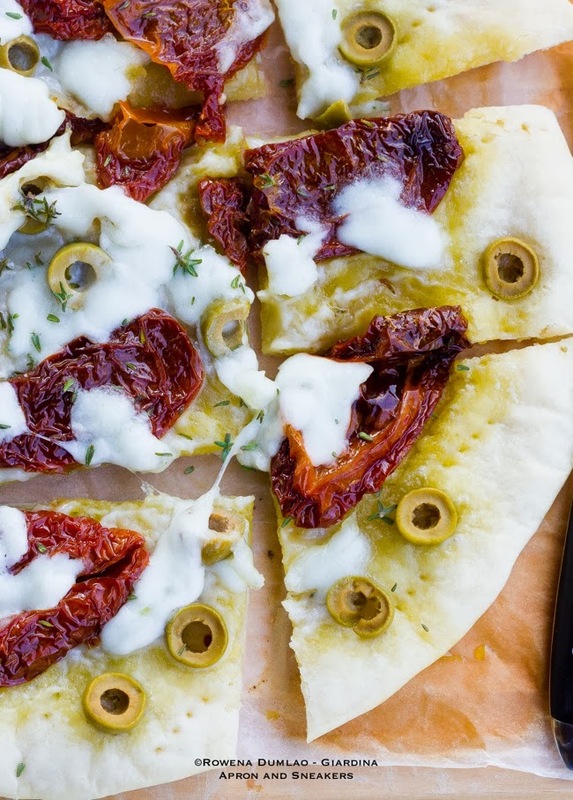 Take out the focaccia from the oven then sprinkle the mozzarella on top. Bake for 5 - 8 more minutes in the oven. Drizzle with new extra virgin olive oil before serving. Crumble the yeast in a small bowl. Add the sugar, a little bit of lukewarm water, about 1/4 cup, from the 350 ml. of water. Mix well until the yeast melts. Mix the salt with the remaining water. Put the flour in a large bowl (or better in a mixer). Add the yeast mixture, oil and salted water. Mix the ingredients very well until the dough becomes smooth, elastic and a little bit sticky. If the dough is too sticky to work with, add more flour until you have a ball. Just remember that the less flour there is, the better it will be because the focaccia might come out dry. Take away the dough from the bowl, sprinkle some flour at the bottom of the bowl then put back the dough. Cover with a clean cloth and let it rest in a warm, draft-free place for 2 hours (or until the volume of the dough rises to twice its size. After the dough rises, transfer it on a well-oiled baking pan or a pan with baking paper and flatten it with your hands. The thickness should arrive at 1 cm. or thinner if you prefer. Once flattened, make holes all over the dough by plunging all your fingers on it. Prick the focaccia with a fork.